President Bush, politically weakened but determined to set the agenda in this election year, made freeing America from its oil dependency the centerpiece of his State of the Union address Tuesday night. CBS News senior White House correspondent Bill Plante reports the president, as expected, also talked about the war in Iraq and the threat of nuclear weapons from Iran. But the headline was that the former oil man in the Oval Office said he believes that the United States needs to develop different sources of energy. "We have a serious problem. America is addicted to oil, which is often imported from unstable parts of the world," he said. "Breakthroughs on this and other new technologies will help us reach another great goal: to replace more than 75 percent of our oil imports from the Middle East by 2025," Mr. Bush told a joint session of Congress and a national prime-time television audience. As has become traditional, Mr. Bush was hoping to capitalize on the attention surrounding the year's biggest speech by delivering a recap Wednesday in Nashville, Tenn.
After a tumultuous political year dotted with scandals swirling around his administration and dismal approval ratings, Mr. Bush sought to show Congress and the nation he could still lead forcefully. Seeking to quell the rancorous tone in Washington, Mr. Bush asked legislators to conduct debate in a "civil tone." Democrats were skeptical. "I hope it's genuine," said Sen. Joe Biden, D-Del. "He says that all the time and then his administration comes out through the vice president, the secretary of defense and others, and says anyone who criticizes the war, they imply they are not patriotic. "I hope we're beyond that," Biden told CBS News' The Early Show. I think the president is in enough trouble politically that he understands it's time to reach out." Mr. Bush later switched gears, calling the U.S. economy "healthy and vigorous" and also asked Congress to make his proposed tax cuts permanent. "If we do nothing, American families will face a massive tax increase they do not expect and will not welcome," Mr. Bush said. To boost competitiveness, the president called for the training of 70,000 high school teachers to lead advanced placement courses in math and science. "If we ensure that America's children succeed in life, they will ensure that America succeeds in the world," said Mr. Bush. Members of Congress from both parties applauded this statement on health care: "Keeping America competitive requires affordable health care." But not all applauded the president's solutions: stronger health savings accounts and medical liability reform. Democrats in Congress jumped to their feet, laughing and cheering, when the president said, "Congress did not act last year on my proposal to save Social Security." This year, Mr. Bush simply asked for a commission to study the impact of baby boomer retirements on the federal government. About half the speech was devoted to the president's arguments for the war in Iraq and his vision of the nation's place in the world. 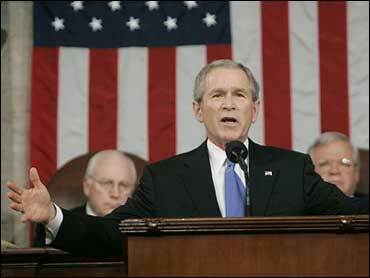 Mr. Bush rejected calls for the withdrawal of troops from Iraq, saying, "There is no peace in retreat.'' He also slapped at those who complain he took the country to war on the erroneous grounds that Iraq possessed weapons of mass destruction. "Hindsight alone is not wisdom," Mr. Bush said. "And second-guessing is not a strategy." Mr. Bush asked Americans to support his fight for freedom abroad and against terrorism at home, saying, "our enemies and our friends can be certain: the United States will not retreat from the world, and we will never surrender to evil." Administrations officials told CBS News chief White House correspondent John Roberts that the president has said the Sept. 11 terrorist attacks are "tattooed on his brain" and that he will never forget it. Mr. Bush promised not just to continue the hunt for terrorists, but, if anything, to intensify it, Roberts reports. "Our nation has only one option," Mr. Bush said. "We must keep our word, defeat our enemies and stand behind the American military in this vital mission." Mr. Bush told the citizens of Iran that America respects them, but he again denounced the nuclear ambitions of their leaders. "The nations of the world must not permit the Iranian regime to gain nuclear weapons." The president called on Congress to renew the Patriot Act and again defended eavesdropping on conversations to and from overseas. But he also painted a picture of a nation grown more hopeful, a vision not shared by Democrats. "Our federal government should serve the American people," said Gov. Tim Kaine of Virginia in the Democratic response. "But that mission is frustrated by this administration's poor choices and bad management." Kaine said the answer is change. "Democrats are leading that reform effort," he said, "working to restore honesty and openness to our government, working to replace a culture of partisanship and cronyism with an ethic of service and results." A CBS News poll found that viewers liked what the president had to say. Of those who watched, 77 percent said they approved of the proposals that the president laid out. But most do not have faith that the president can get the job done. Just 32 percent believe that he'll be able to accomplish all the goals set out in his speech.